Be the first to share your favorite memory, photo or story of Herbert "Herb" . This memorial page is dedicated for family, friends and future generations to celebrate the life of their loved one. Herbert “Herb” Bernard Radke, was born November 26, 1933, in Beaver Dam, WI, to Sidney and Cecelia (Mulvaney) Radke. He grew up in Minnesota Junction with his brothers and sisters. He was drafted into the US Army, serving 2 years as an ambulance driver in Colorado, before being honorably discharged. He was united in marriage to the love of his life, Joyce Rabehl in June 1957. In 1960, they settled in Fox Lake, where they raised their three wonderful children. He worked at Metalfab in Beaver Dam for 44 years when he retired in March 1996. During his life, he was a phenomenal father who loved his children fiercely, abundantly adored his grandchildren, and was enamored with his great-granddaughter. He enjoyed many years of camping, bowling, playing golf becoming a member of the Fox Lake Golf Club; was a 45-year member of the American Legion, Post 521; and loved to watch his favorite sports teams, the Packers and the Brewers. 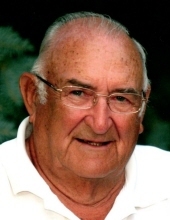 He was a member of St. John’s Evangelical Lutheran Church in Fox Lake for over 60 years. He is survived by his wife of 61 years, Joyce, of the home; son Bart (Steph) Radke of Beaver Dam, WI; son Darren (Laurie) Radke of Marshall, WI, daughter Beth (Jason) Miller of Oklahoma City, OK, his amazing grandchildren, Bryan (Breanna) Radke of West Allis, WI, Anna Radke of Milwaukee, WI, Sean and Alyssa Radke of Marshall, WI; Dan and Caleb Miller of Oklahoma City, OK, Luke and Jaelie Golden of Beaver Dam, WI; and one beautiful great-granddaughter, Aria of West Allis, WI, along with his siblings, in-laws, many nieces and nephews, and a multitude of great nieces and nephews. He was preceded in death by his parents, Sidney and Cecelia Radke; in-laws Harley and Margaret Rabehl; brother LeRoy Radke; brothers-in-law Don Rabehl, David Rabehl, and Sonny Walker; sisters-in-law Shirley Rabehl and Helen Rabehl, niece Wanda Radke; nephew Wayne Walker, among other aunts, uncles, and friends. There will be a memorial service on Saturday, October 6th, at 11am at the Kratz-Smedema Funeral Home in Fox Lake. Military rites will be conducted by the Robert W. Ginther Ameriacan Legion Post 521. A luncheon will immediately follow at St. John' Lutheran Church fellowship hall. To send flowers or a remembrance gift to the family of Herbert "Herb" Bernard Radke, please visit our Tribute Store. A funeral luncheon will follow at St. Johns Lutheran Church in Fox Lake. "Email Address" would like to share the life celebration of Herbert "Herb" Bernard Radke. Click on the "link" to go to share a favorite memory or leave a condolence message for the family.